Although I didn't grow up with horses, they're in my blood. My mom moved to Hawaii at the age of ten when my grandfather, a meteorologist for the Air Force, was stationed on the island of Oahu. 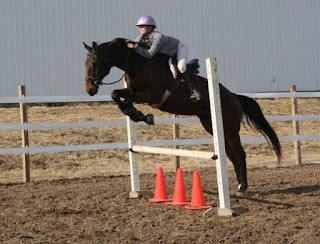 She was an avid pony clubber, competing in everything from western pleasure to 3-day eventing. She moved to Missouri when she married my dad, where she bought and trained a Quarter Horse by the name of Mr. Ranger Rick. Although she sold him when I was born, we kept in touch with his new family and some of my first rides were on his solid, steady back. Growing up, I begged, borrowed and stole rides wherever I could find them. I showed in lots of local fun shows, ribboning in everything from halter to English and Western Pleasure, with a lot of trail riding in between. 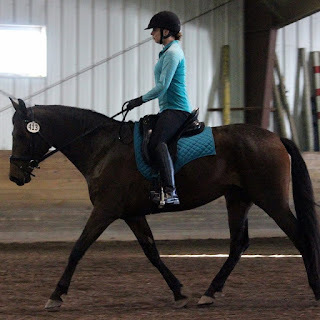 Although I had very few formal lessons, I spent every moment I could in a barn - so it was no surprise to anyone when I spent every last dollar of my graduation money on an 11 y/o OTTB named A.J. 's Steel (who I promptly renamed Jack). Calling Jack "broke" would have been a generous leap - and in retrospect, it's probably a miracle that neither of us died in my first year of ownership. He was a stubborn, rude horse who had gotten away with murder with his previous owners, and never had much training beyond his initial track training. He spent 6 months in boot camp with my mom, and then headed off to William Woods University with me, where I boarded him near campus. Although I didn't ride in the WWU equestrian program, I did get lots of help from my classmates, and Jack eventually turned into a mediocre jumper. He never really got to a point where I would consider him broke, but we did have a lot of fun, and he taught me everything I needed to know about sticking in the saddle and being prepared for anything! During my time at WWU, I met my Dear Husband (DH) Myles - although he took some lessons and rode in the occasional show as a kid, he hadn't been around horses in years. I promptly changed that, introducing him to Jack and my second horse Jasper, a lovely NSH who had fallen on hard times. 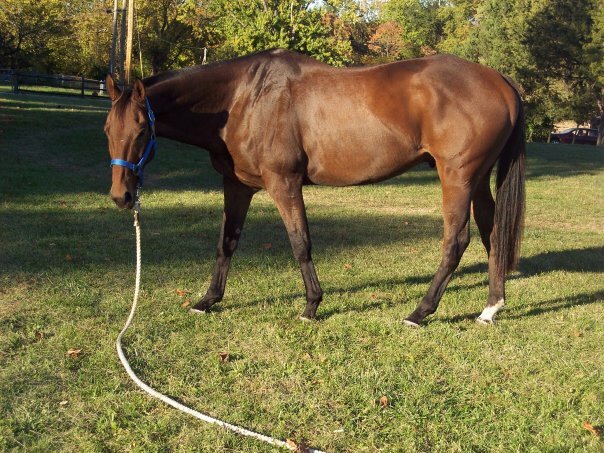 With two horses, we decided keeping horses at home would be cheaper than boarding, so we purchased 17 acres of pasture and proceeded to start turning it (slowly) into a horse property, acquiring a nice gelding named Trigger for DH along the way. 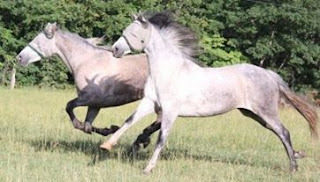 The summer I graduated from WWU, I had the opportunity to purchase two Iberian mares, and my life was forever changed. Topaz and Tres opened up a whole new world for me, and I never looked back. Both mares showed an affinity for dressage, so I retired my jumping saddle and headed for the world of black and white - becoming a dressage junkie along the way! Currently, I work in communications for a state agency - although it doesn't pay well (Missouri boasts the lowest paid state workers in the nation), it does offer me plenty of time off in the form of state holidays, and generous vacation time (which I obviously spend on horse-related activities). I keep three horses at home and board one out - Missouri's variable weather shenanigans make having access to an indoor arena a necessity. I'm in the process of searching for a new dressage trainer as I work on bringing my two young dressage prospects up the levels. The name of the blog is entirely tongue-in-cheek, in case that wasn't glaringly obvious - my farm colors are black and teal, so I jump at the chance to outfit my girls in those colors at shows, clinics, and everyday life. At a dressage schooling show last fall, the show manager referred to me as dressage Barbie (my mare and I matched very nicely in entirely teal and black attire) and the nickname seemed perfect for my foray into the world of blogging. Awww thank you! I'd been lurking for a bit but decided it was time to start commenting! I love all the long distance riding you do, and the great photos!